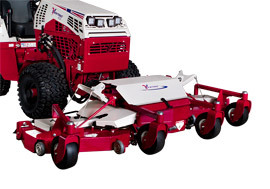 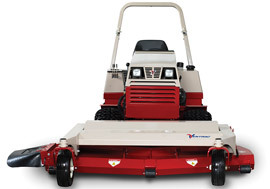 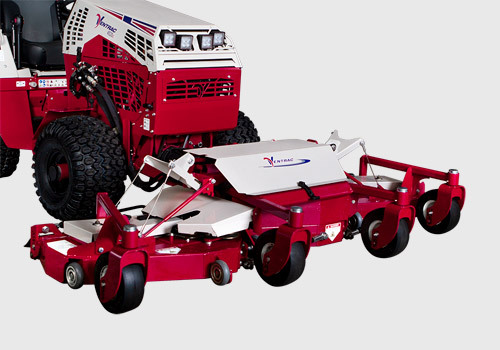 Ventrac finish decks are designed to be the best cutting and longest lasting finish mowers available. 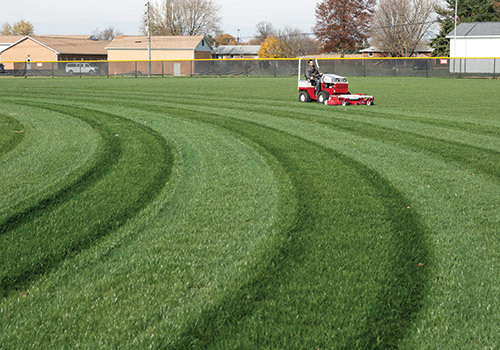 The full floating deck prevents scalping and will float over the landscape without gouging or tearing up turf, leaving a professionally manicured field of grass. 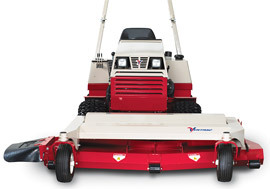 Features such as easy height adjustment and a flip up deck design make Ventrac mowers easy to operate and service. 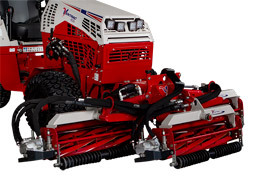 Cutting Height 1.5 - 3.75" .75" - 4" 1 - 5" 1 - 5" .75 - 4" .75 - 4" .39 - 2.36"
Cutting Width 44, 52, OR 60" 52" 60" OR 72" 72" 60" 84" 74"
A striped lawn is a stunning lawn. 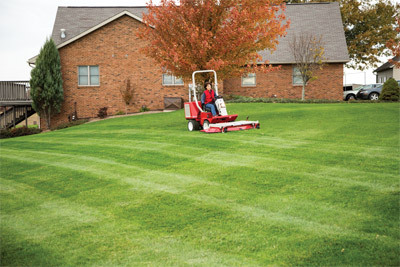 The results you get from Ventrac finish mowers will give you a lawn you can be proud of. 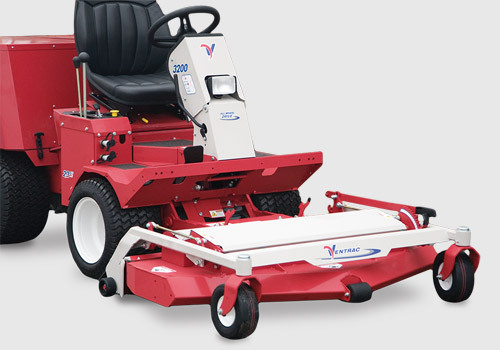 The full-width rear rollers on each of the finish mowers create a professional striping pattern. 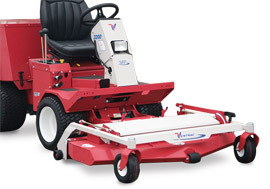 You can tell when a lawn has been mowed by a Ventrac! A full floating deck prevents scalping and will float over the landscape without gouging or tearing up turf. The progressive flow deck design allows for grass to move quickly and easily through the mower and out the discharge chute to leave a flawless finish. 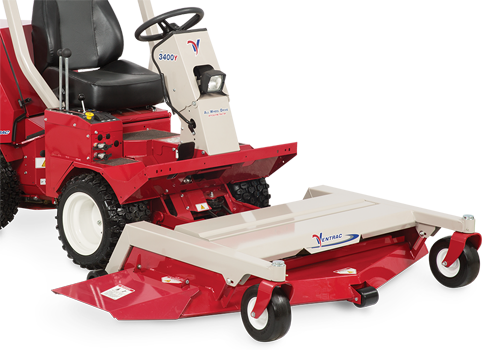 Ventrac's finish mowers offer you a variety of cutting positions, height levels, and cutting widths to meet your mowing needs. A single lever allows you to quickly make adjustments. 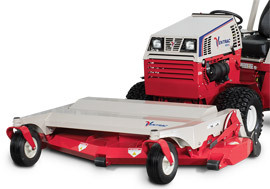 The flip-up deck design is ideal for easy storage, transportation, and servicing. 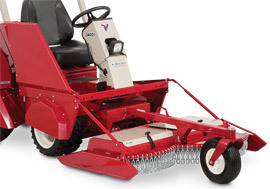 It requires no tools or the removal of belts. 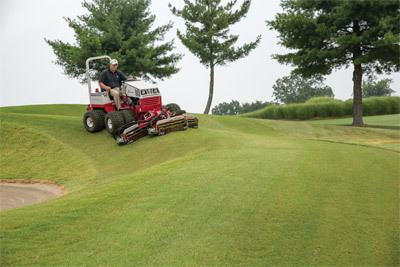 The unique design qualities of Ventrac has made a world renowned statement for its ability to work on steep slopes. For more details, visit our slope page. 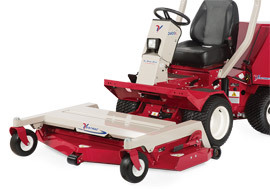 Made with rugged commercial grade components, Ventrac finish mowers will hold up to years of use. 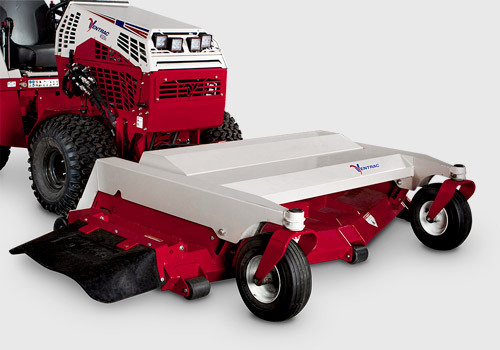 Built with heavy gauge steel and a reinforced frame for reliable performance and less down time. 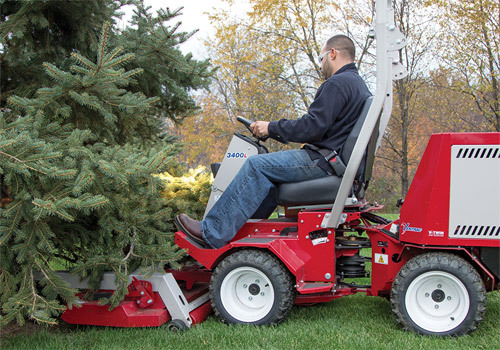 When attachments are in front of the tractor, you have increased visibility, better reach under trees, and more control over the work being done. 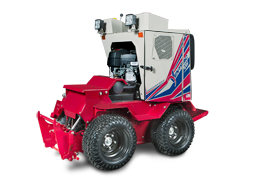 Better visibility also creates a safer environment for the operator and bystanders. 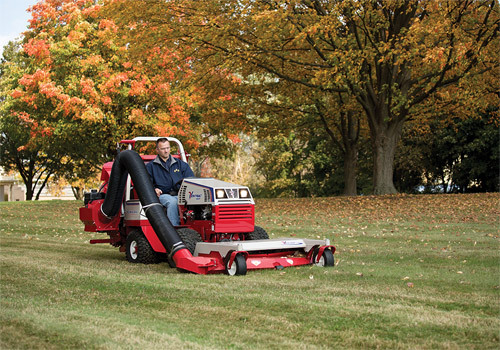 The Vacuum Collection System is the professional choice for quickly clearing the fall leaves that blanket the yard. 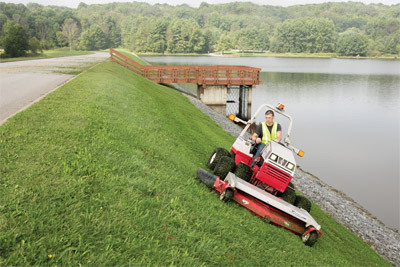 Glenn Garrett of Retention Pond Services discovered one Ventrac mower could replace 12 employees with string trimmers. 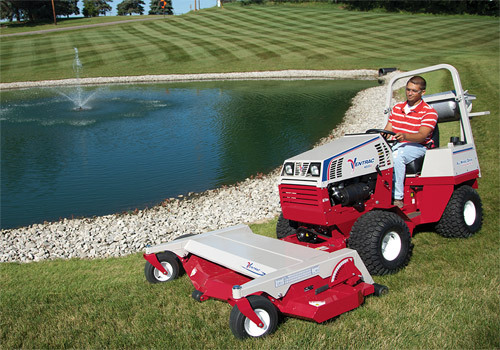 Today Ventrac is an integral part of his business. 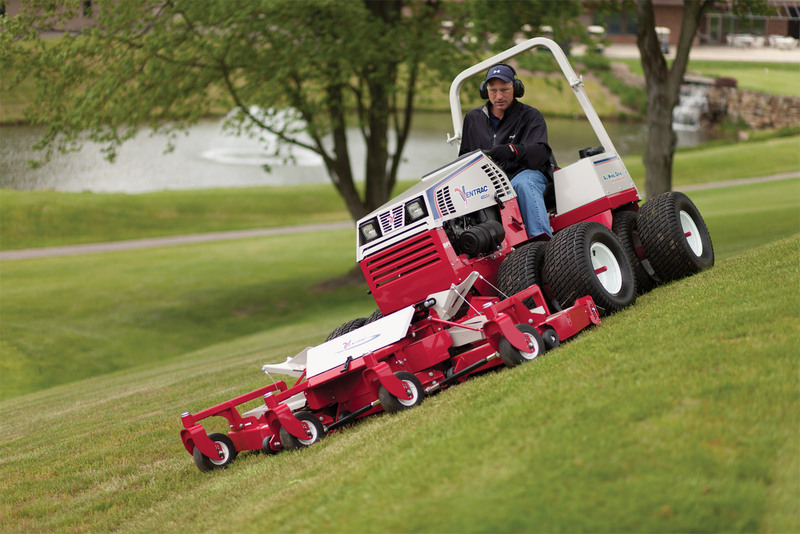 To date, Garrett has purchased 60+ Ventrac 4000 series tractors. Mark shares his secrets of how he makes his yard the envy of the neighborhood. Using his Ventrac tractor and mower attachment, Mark stripes is lawn, leaving it looking like a professional ball field. 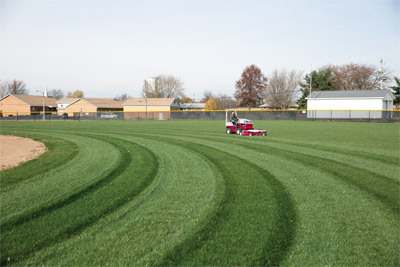 Beau Mastrine is the Director of Grounds at The College of Wooster. 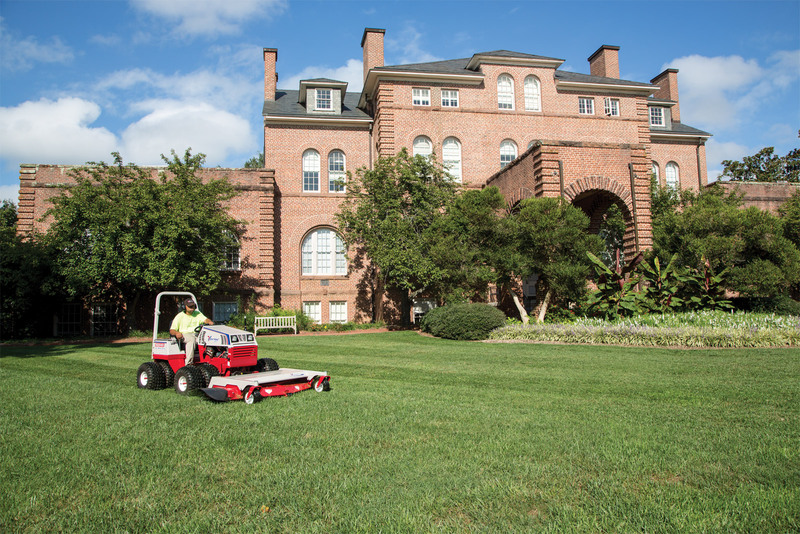 In this short video, he explains how mowing with a Ventrac is beneficial on their campus. 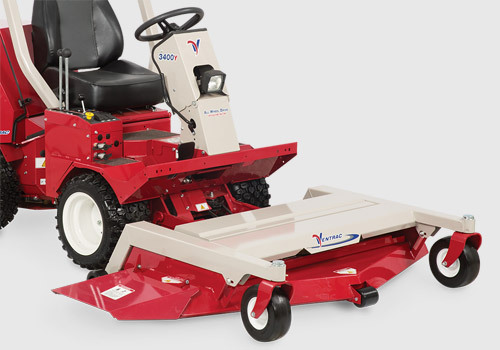 Ventrac mowers feature a flip-up deck design, allowing the underside of the mower to be cleaned and serviced without having to disconnect from the tractor or even remove a belt! 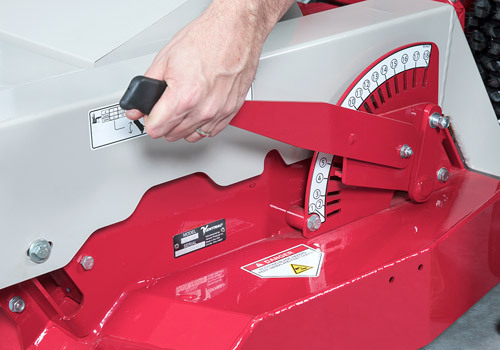 Simply raise the deck, remove both pins, tilt, and replace the pins to safely access the blades. 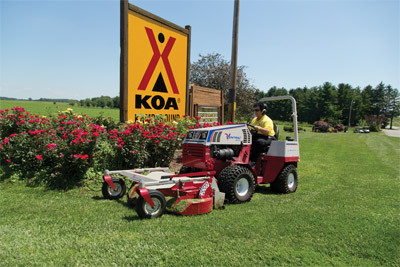 Joan Miller was tired of spending her entire weekends trying to maintain nearly thirty acres of rough, hilly terrain and thick wooded areas. 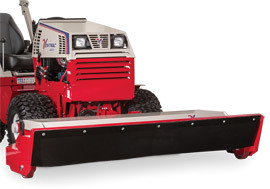 So she turned to The One Tractor Solution to help get the job done faster and easier than ever. 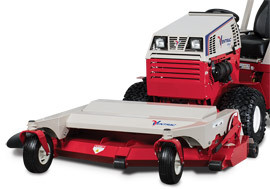 Ventrac made it possible to reclaim her valuable weekend time. 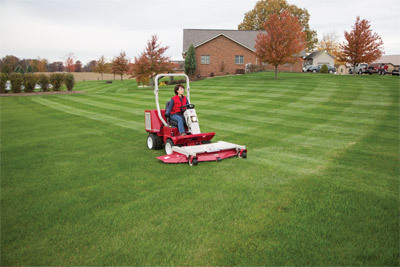 Deck Width Please enter a valid number. Enlarge Picture / Press Link · Ventrac 4500 with Dual Wheels and MR740 Reel Mower - The reels can be offset right and left of center to allow for better trimming around tight turns, and to position the tractor farther from hazards such as water or bunkers for increased safety. Enlarge Picture / Press Link · Ventrac 4500Z Precision Mowing with Reel Mower - Confidently mow around waterways and other obstacles with the all-wheel drive, center articulating 4500 while the Reel Mower leaves behind nothing but beautiful lawn. 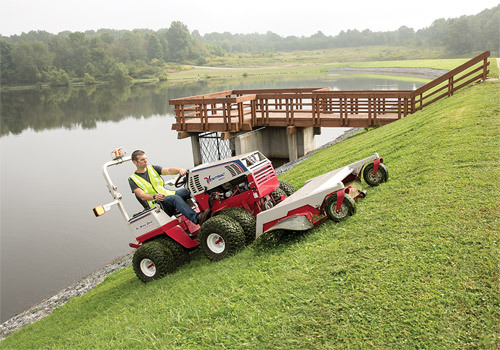 Enlarge Picture / Press Link · Ventrac 4500 with 72 inch Deck - Slope mowing with the Ventrac is safer and more stable and the large 72 inch mowing deck gets the job done faster for less time spent on those steep slopes. 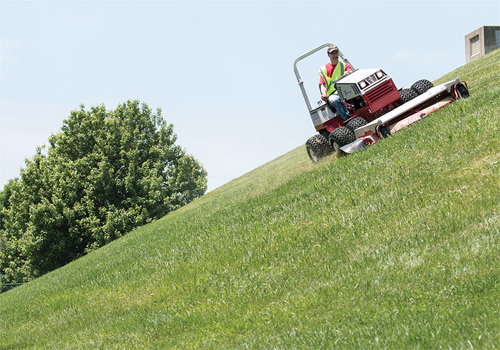 Enlarge Picture / Press Link · Ventrac 4500 AWD Slope Mowing Tractor - Shown using the HM722 Mowing Deck, finish mower, for a perfect cut even on slopes. 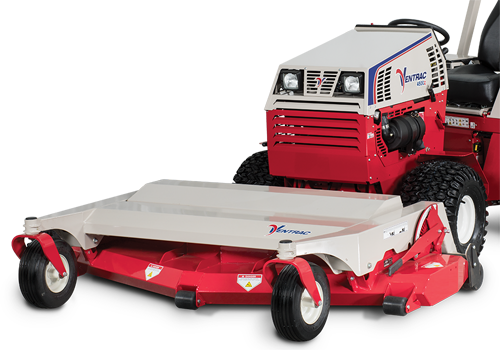 Enlarge Picture / Press Link · Ventrac HM722 Finishing Mower on the 4500 - The Ventrac gives you professional results every time, and thanks to heavy duty construction, for years to come. 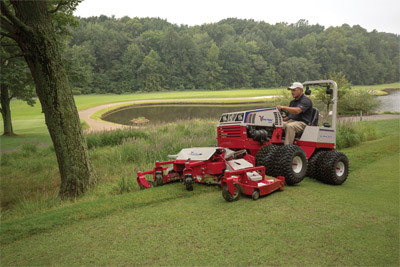 Enlarge Picture / Press Link · Ventrac 4500 Mowing with MC600 - With the 60-inch cutting width and 15 cutting positions of the MC600 mowing just became a lot more fun and a whole lot easier. Your lawns and parks can be beautiful and healthy in no time, with the help of Ventrac. 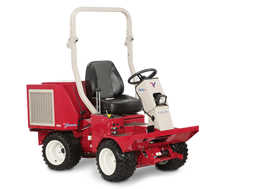 Enlarge Picture / Press Link · Ventrac 4500P mowing with Contour Mower - Optional dual turf tires adds maximum traction with minimum turf damage. Enlarge Picture / Press Link · Ventrac 4500 using the MC600 60 inch Mower Deck - The out front mounted mower deck attachment allows you to get closer to shrubs, flower beds, and other landscaping without damaging them. 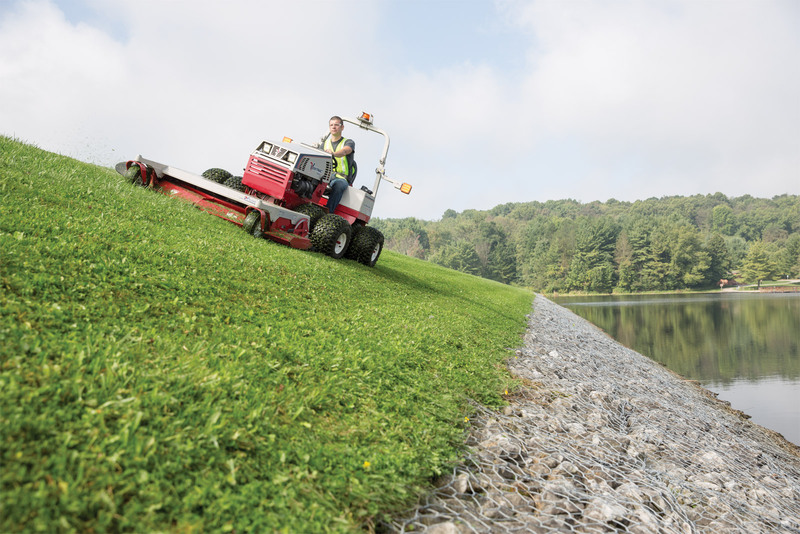 Enlarge Picture / Press Link · Ventrac 4500Z using Contour Mower - Three decks float independently and follow the contour of the terrain with up to 40 degrees of motion for each side deck. 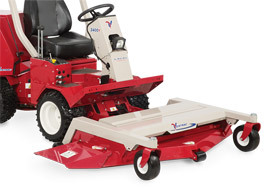 The MJ840 also features full rear rollers for even cutting and striping, rear discharge, and a flip-up deck design. 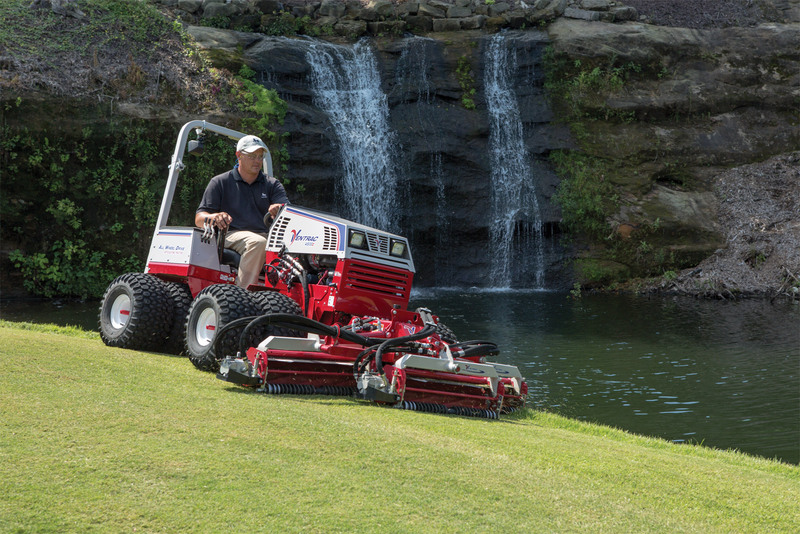 Search for your nearest Ventrac dealer to schedule your demo today. 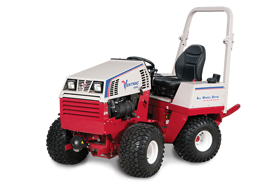 Explore our financing options to make your dream of owning a Ventrac a reality. Get the information you need to discover how Ventrac is Your One Tractor Solution.